Get accurate information to and from your mobile workforce and citizens in real time by using a mobile government strategy. Use this information to populate dashboards for a better record of what is going on in your community. Share relevant information from your mobile workforce with the rest of your organization and the public to enhance engagement. Analyze this data as it comes in so that you can make better-informed decisions and gain insight into your community. Esri is committed to helping governments get the most out of their GIS investment through the use of mobile technology and support. 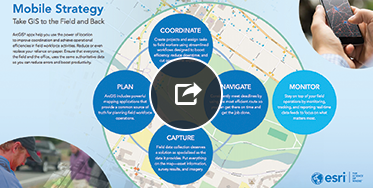 Esri's solutions for mobile data collection empower your organization to collect, geoenable, and analyze data with greater speed and precision. Turn your mobile strategy into a highly efficient and synchronized operation. Enhance your plans for field data collection operations with up-to-date maps and simple analytics. Easily coordinate field projects and assign tasks in real time and reduce operational expenses. Get your field crews to the next project site on time and ready to go to work. Simplify field data collection by using familiar devices, such as smartphones. Stay on top of every aspect of field data collection activities with a real-time dashboard to track your assets. Make sure your investment in drone technology pays dividends with every mission. Our experts are ready to answer your questions about mobile operations.